30 years of unique newspaper coverage of local, regional and global topics - serious and light-hearted. Videos You Should Not Miss! All Island Tides redundant street boxes have got a new life! With a makeover theses waterproof boxes are making excellent community street libraries. 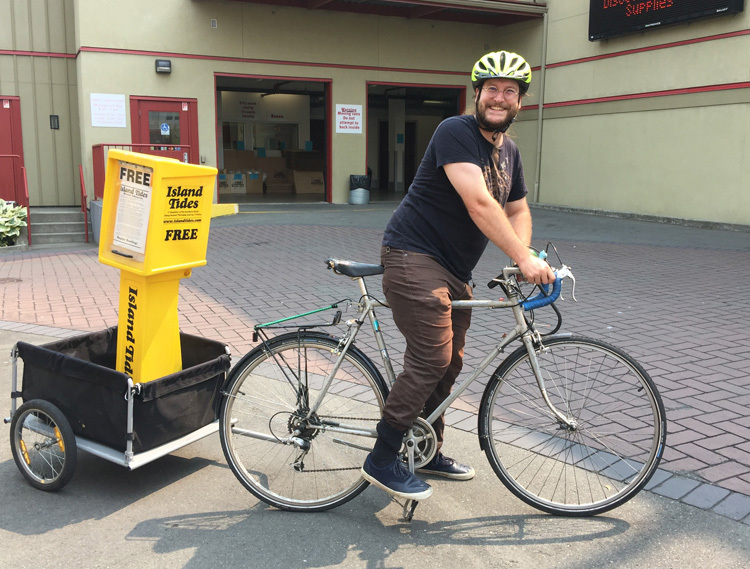 Here's Teale Phelps Bondaroff, mover and shaker of Greater Victoria Placemaking Network, moving one to a new home! Island Tides is still on sabbatical from new editions. Christa is thinking about what might happen next. Meanwhile surf our archive (searchbar is below or click Previous Editions +Reprints above) for previous good reads about all your current topics! There's tons to read and beautiful photos to enjoy. If you are interested in a specific topic, type it into the search bar, at the bottom of this homepage, make sure it's set to search www.islandtides.com (not the whole web). You'll be amazed what you find. You could search more conventionally from our 'Back Issues and Reprints' section, back as far as 2003. Everything before that (and after) can also be found in the BC Provincial Archive. On Island Tides pages connections arose; as if by magic. Our aim — by putting 'found objects' of news and pictures together — was to create a side-by-side spread which will allow you to gain insights to help you think outside the box. Intensified serendipity. We can't thank our contributors enough for sending along important news and ideas and glorious images. People often talk about our 'team', What it really is—as Jim Campbell once said of doing the Saturna Lamb BBQ— is 'inspired ad hockery'— by dozens of passionate west coasters. It's what we do on the coast: we pitch in, we have our say, we know stuff, we can think about stuff, we can express it, and we help each other. Keep in touch. And ask to get yourself on our email reminder list so we can tell you what's up. Christa hopes to post some new stuff on her badly neglected blog (link to left) and will keep you updated on the progress of her book, Electing Elizabeth: how a westcoast community elected the first Green in North America. Late breaking news and fun stuff, follow Island Tides on Twitter: @islandtides. Visit editor & publisher Christa's blog at islandtideschrista.wordpress.com. Check out Island Tides TV, our YouTube channel. Home | Top | Site Map | Contact | © Island Tides Publishing Ltd.